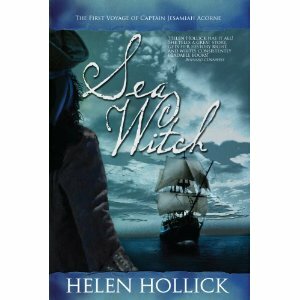 This is the first of Helen Hollick’s books I have read and on the strength of it I have now bought book two as well as the Arthurian series. I am half way through book two and getting to know the characters even more. This is a fun blend of authentic historical action adventure in the pirate era – you can almost hear the rigging creak and the wind blow – with a light touch of fantasy and sorcery. The story is that of a rogue pirate Jesamiah and the young girl destined to be his lover, the white witch, Tiola. Jesamiah is a engaging hero and Tiola, an at time fierce heroine. The story winds back and forth between them keeping the reader interested in both main protagonists. Hollick is not afraid to use graphic descriptions both of the fighting scenes and the sexual encounters and manages to portray a grimey, oftenÂ desperateÂ world with believable heroes and villains. You can tell that more books were planned right from the start as there are major characters introduced who are designed to be recurring figures. A sense that more is yet to come is also apparent in the fantastical parts – in particular the interaction between Tiola and Tethys a goddess of the sea. The descriptions are rich and detailed, the dialogue authentic and laced with many 17th century expressions and curses Â and as such may not suit some readers not used to archaic terms.Â ButÂ anyone reading a historical novel is generally after the detail – the feeling that Â you are living the moments with the characters and you certainly get that here and Hollick does not drown you in detail: it is more a case of being nicely immersed. It sounds like this book will definitely take you on an adventure! I can’t wait to read it.